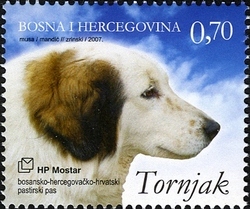 Also known as the Bonanski Ovcar Tornjak, this ancient breed has been protecting the flocks of sheep and cattle in Bosnia and Croatia for at least 1,000 years. The word ‘tor’ means a sheep-pen. In origin this heavily built dog has been viewed as a descendant of the Tibetan Mastiff, with the later addition of spitz dogs and possibly some back-crossing to the Wolf. According to the shepherds who work with these dogs and keep them close to their flocks day and night, they are capable of chasing away marauding bears. Any one of them is more than a match for two hungry wolves. In addition to their bravery, they are also extremely loyal, often stubborn, wary of strangers, and rather dignified. Their owners describe them as noble dogs, never looking for a fight, but ready to defend their flocks to the death if necessary. This rare breed is not yet recognized internationally and its numbers are low. In 1997, it was recorded that there were then only about 200 of these dogs with registered pedigrees. They, however, are becoming more popular at local dog shows and as many as 30 entries have appeared in recent times in a single show. 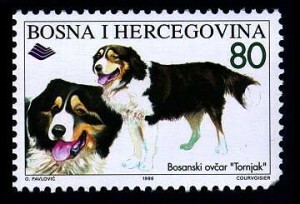 This newly aroused interest in the breed bodes well for its future and in 1996 it was given an extra boost when it was chosen to appear on a Bosnian postage stamp. Re-published with permission from the author. A thank you to a boy named Logan for bringing this text to the attention of the editors.